I spend most of my work day on my feet and have been feeling the effects of low back pain. It is dull and achy and I notice that the muscles are tight. I am very aware of the effects of having the pelvis out of position and the low back tightening to balance yourself because of the pelvis position. Something that I have become aware of is the importance of where your weight is distributed on your feet and the effect on the position of the pelvis when you are standing. In my observation, a very good portion of the population have their weight from the mid foot to the front of the foot. If you try this, you may notice that your pelvis and the upper body will automatically shift forward. Your shoulders will want to be directly over your pelvis and this forward translation will move your shoulder and upper body in front of where your feet are. To correct this, your low back will tighten and cause a little extra curvature in the lower and mid back to pull your shoulder back so they are over your feet again. This is the type of tightness that will produce a closed position in the joints in the low back and fatigued, tired and sore back muscles. The best alternative to reducing this tightness and pain in the low back and hips is to keep your knees just a touch unlocked and move the body weight to the midfoot to the heel of your foot. If you do this, from having your body weight on the front of your feet, you will notice that your pelvis and back will move back into line where your upper body is directly over your feet again. Now your lower back won’t have to tighten to compensate and the joints in your lower back will be open and will move much better. With your knees unlocked, they will also be involved in stability so that your back and hips aren’t doing all the work. If you are on your feet all day, give this a try. A question that I am asked a lot is “should I take pain medications” when someone comes in with an issue. My personal feeling is that pain is an indication that something is going on that needs attention. The allure of pain medications is that it quickly and easily reduces pain but perhaps to the point where we may end up continuing to do something that maybe we shouldn’t. An example might be low back pain. If the low back begins to be sore, often more times than other perhaps a joint is not quite moving properly or or we are sitting or moving incorrectly overstraining a muscle. If we take the pain meds, it will allow us to continue moving or sitting incorrectly or to leave a joint jammed or similar. Pain is an indication that change needs to be made and we have to be aware of that. The times when medications are good is when pain affects our ability to go about our day or affects our sleep or has become so great that it is unmanageable. For example, the pain keeps the person up at night or they aren’t able to go out to buy some groceries or similar. Sometimes if there is local pain because of tightness in a muscle, if you can stay at home, icing 3-4 minutes on and then 10 minutes off is an excellent way to deal with the discomfort. I suppose this blog entry is an effort to have you consider what reason you are taking the pain medications and that you don’t rely on them totally giving you the ability to be accountable and make any changes that can create long lasting effects with reduced pain, whatever it might be. A big side effect of the NSAIDS (most common groups of drugs) is their affect on the liver and kidney. Here is some information on NSAID pain medication. Headaches are something that many people suffer everyday. They can appear to arise out of nowhere and be short term or last many days. Many of these headaches occur from hyper-irritable spots in the muscles of the neck and shoulders. Palpation of these spots in the muscles can reproduce these headaches. In assessing the presentation, very often the muscles producing the headaches are either in a lengthened, strained position or they have been put in a shortened position. This can occur often when the neck is put in a poor position for a lengthened period of time, perhaps at work or extended periods of time at a computer. It can often occur as well, as I’ve mentioned in previous entries, when the neck is tightening to level the head when the shoulders are out of position. Treating the symptoms is fairly standard in releasing the trigger points in the muscles that are causing the headaches and making sure there is normal movement in the joints of the neck but more emphasis is put on preventing the reoccurrence in the future. For example, if the muscles and tissues at the front of the shoulder are tight, this can cause you to slump slightly so that you will end up looking downward towards the floor, so your neck muscles will tighten to pull your head straight. It is these muscles than may end up tightening for long periods of time and can develop trigger points that may refer dull achy pain (headaches) to your head. Part of the treatment will be to reduce tightness of the front shoulder muscles, mobilize the upper back joints, if necessary, to allow your back to come out of the slumped forward position, teach a stretch to keep the joints and front chest muscles stretched but most importantly, teach postural awareness. We can mobilize and stretch and strengthen forever but the body will always want to fall back into the position which it is used to, which might be the slumped forward position. The way to encourage proper position, is to give the body a reward for making the change, which may be decreased pain or increased neck movement and shoulder movement. If the body recognizes a benefit to making the change, then it will be more likely to stay in that position. So, most of the time, headaches can occur from neck muscles that are doing what they are supposed to do because of imbalance further down. They can be dealt with easily by good shoulder position, pliable muscles and adapting your posture and activities that can be contributing to the imbalance and tightness of the neck muscles. Above is an example of the Trapezius muscle. A muscle that will become lengthened and weak when slumping forward, if you can imagine the shoulders rolling forward and shoulderblades moving outwards slightly. 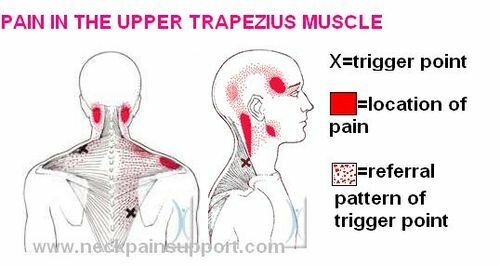 The trigger points would be where the X’s are and the red areas are where the dull achy pain is found, so you can see how the headaches can come about from muscles in the upper back and neck. There are other muscles are well that can send headaches to other parts of your head like at the top or behind the eyes. Once the muscles are released, the joints are functioning properly and the shoulders and upper back are rebalanced, headaches should not be an issue any further. If they do continue, and are unrelenting, it is good to visit your doctor. Getting tissues to stay in a stretched position can often require some patience. We have to remember that muscles are composed of Fascia ( a type of connective tissue) and also that the muscle have a component of the nervous system attached to it. In a course that I took, the general philosophy was to hold the tissue in a sub maximal intensity for a longer period of time, often 2 or 3 times as long as you think you would need to. The general nature of the connective tissue that binds muscles together (and holds them together) are that they are made up of something called the Ground Substance. The great thing about this Ground Substance is that if it is held in a gentle stretched position for a long period of time, and given the chance, it will rearrange itself so that when the tension is released, it will better stay there. I like to use the analogy of stretching leather. If you are stretching leather really hard for a short time, it will probably creep back to where it was originally. If you hold the stretched leather for longer, then it will stay there. It’s the same thing with muscles. In addition to those properties, there are stretch receptors that monitor the amount of stretch being applied to the muscle tissue. If the muscle has been shortened for a long period of time, then the Central Nervous System assumes that is the normal position and will want to keep it there, especially if you are trying to stretch it. So, the deal is you want to try to stretch the muscle without making it fire too much (which will, if effect counteract what you are trying to do. This is where the sub maximal pressure comes into play. If you hold a stretch at 50 – 60% of what you think, for twice as long, I think you will get to where you need to be, you won’t cause the stretch receptors in the muscles to start firing the muscle that you are stretching and it will much more likely stay in that stretched position giving you much better flexibility. Be gentle and hold for longer. It’s better. There is a form of Visceral (organ) Manipulation that I do that can help with a form of Prostatitis (or inflammation of the Prostate). There are two basic forms of Prostatitis. One is either acute or chronic form of Bacterial Prostatitis, which as it’s name incurs, involves a bacterial inflammation of the prostate. The second form is what is considered Idiopathic Prostatitis, which is inflammation of the Prostate without a Bacterial Infection. It is my contention (with the courses that I have taken and my experience) that it is simply inflammation that has occurred between the Bladder and the Prostate. The Bladder is much larger than the prostate and sits right over top of it. A property with tissue is that compression and immobilization can cause adhesions to occur between the tissues (in this case, the bladder and the prostate). There is an easy way to assess if there are adhesions that have developed between the prostate and the bladder. Each organ has a predictable inherent movement to it. The bladder’s movement is moving upwards and forwards very slightly, then returns to it original position about once every 5 seconds. If this movement doesn’t exist, then there is a restriction at the bottom of the bladder, not allowing it to move in it’s normal pattern. Adhesions between organs can produce inflammation, that can contribute to new tissue being formed, which can explain enlargement of the organ like the prostate. The type of work that I do, is to do what is called a Bladder Lift, where I do just that, to slowly apply an upward pressure to the tissue above the bladder and wait for the bladder to lift away from the tissue below it, including the prostate. There are no latex gloves with this treatment and no going where a person would not want anything to go. I am able to access the tissues and the top of the bladder 2 inches below the belly button so it is very non-invasive and is painless. I think it is a good avenue to approach from with enlargement and/or inflammation of the prostate. There may still be medications that are required to reduce the current size of the prostate, but the treatment I provide can reduce an triggers in the future that can cause reoccurrence of prostate inflammation. If the treatment is successful, generally a visit once every 2 months or so is recommended. It is also very helpful if you are experiencing symptoms like changes in normal urination, ie: more often, all of a sudden ect. What I offer is an avenue that may be helpful if you don’t feel like you are getting results that you want, or perhaps you are having trouble with the medications that you are taking or surgery is recommended. Perhaps the above mentioned will still be necessary, but I always believe that pursuing all avenues and considering all options is a good way to go.